"41UR315, Burial 24, Vessel 120" by Timothy K. Perttula and Robert Z. Selden Jr.
DECORATION (INCLUDING MOTIF AND ELEMENTS WHEN APPARENT): The vessel body is decorated with an engraved concentric semi-circle motif repeated three times around the body, defined top and bottom by two or three horizontal engraved lines, respectively. Each concentric semi-circle element has four semi-circles, two of which have small outward-pointing pendant triangles. Inside the smallest semi-circle is a plain engraved triangle element. Nestled between each of the three concentric semi-circle elements are three lower nested engraved triangles. One has a small central oval and inward-pointing hatched pendant triangles, another has a small hatched triangle and negative oval within it, and the third nested triangle has hatched and cross-hatched corners, a negative oval, and a concentric circle element next to the negative oval. Ripley Engraved, var. 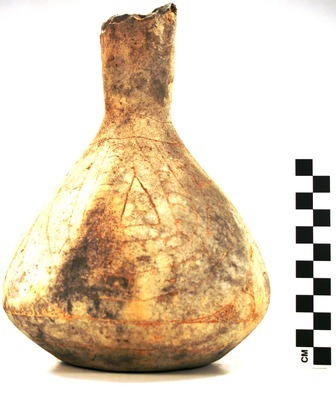 unspecified bottle, Vessel 120, Burial 24.